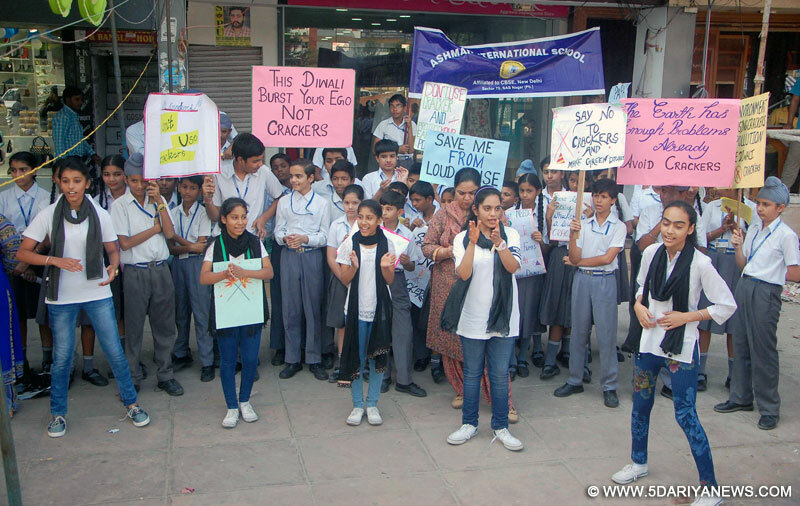 Ashmah International School, Sector 70 organised an anti-cracker campaign. Children are the largest consumers of crackers and it’s high time to educate them about its harmful after effects to their health and environment. The rally started from school campus march up to phase-7. The students as well as residents were educated the ill effects of burning crackers and advocate the idea of celebrating Diwali with candles, sweets and non-polluting green crackers available in markets. The students carried placards carrying messages such as Don’t burst crackers burst your ego, Burn your negativities not crackers, I am Asthama patient help me to breathe etc. Later, Students also created an awareness through nukkad natak at Phase -7 and 5 to celebrate the festival in a green, clean, safe environment and to create an atmosphere filled with the spirit of mirth, love and happiness and not a night of gloom, despair, accidents, health problems and environment degradation.Anti-cracker campaign was flagged off by the Director J.S. Kesar. While motivating the students he said that crackers should not only be avoided but also banned. He urged the students to take this message not only to their families, but also their neighbourhood and adjoining colonies so that this initiative takes the shape of a movement due to harmful effects of crackers to health and environment. Many pamphlets were distributed throughout the city to promote the anti-cracker movement. The students went to various parts of the city holding banners denouncing the use of crackers and even approaching shopkeepers not to sell noisy and polluting crackers.